F. P. Journe celebrates the 30th anniversary of his first timepiece in 2013 with the limited edition F. P. Journe Historical Anniversary Tourbillon, inspired by the very same pocket watch of 1983. 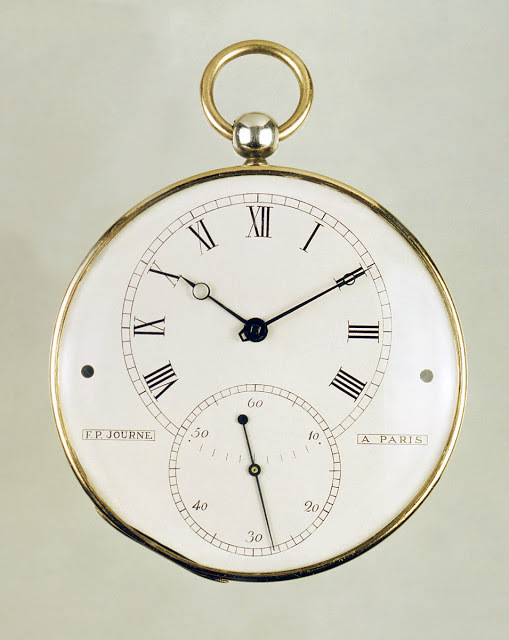 In 1983 François-Paul Journe completed his first timepiece, a tourbillon pocket watch inspired by the work of a great French horologist of another generation, Abraham-Louis Breguet. Thirty years on F. P. Journe has taken that first pocket watch and transformed it into a wristwatch, the F. P. Journe Historical Anniversary Tourbillon. Inspired by nineteenth century watchmaking, the Historical Anniversary Tourbillon is a rare departure from the distinctive Journe aesthetic, found on the Chronomètre Optimum for instance. 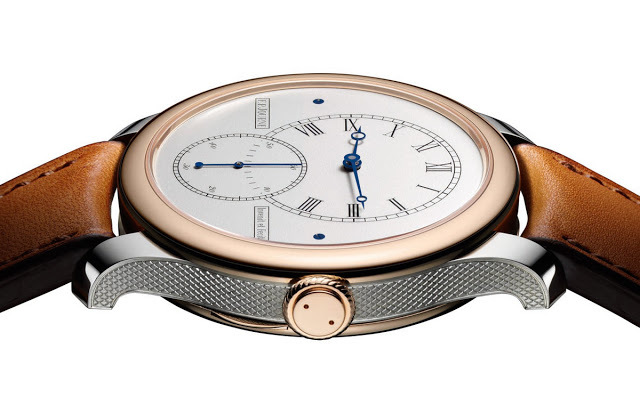 Nevertheless it still retains certain signature Journe design elements, like the case shape and slim crown. Like the pocket watch, the Historical Anniversary Tourbillon has a case in sterling silver, with the front and back bezels in rose gold, along with the crown. Because the sterling silver parts are untreated, they will tarnish and develop a patina, just like vintage pocket watches do. 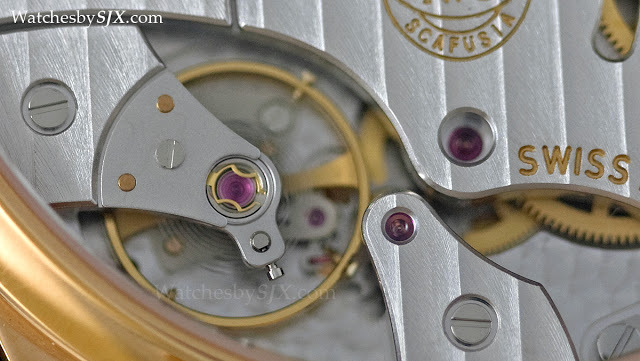 The decorative guilloche on the case back and flanks is likewise taken from the pocket watch. The dial is silvered with a grained texture, while the numerals and minute track are engraved and filled with black lacquer. 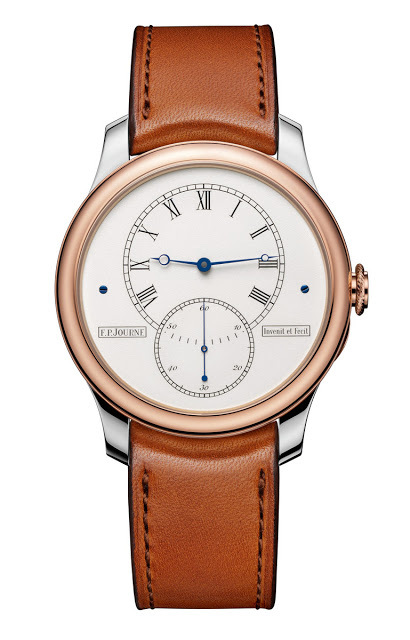 Blued steel is used for the hands, which are naturally in the Breguet style. 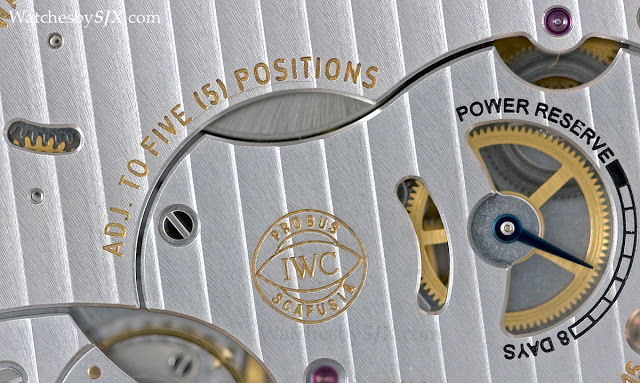 Underneath the hinged case back is the movement, almost identical to the 1983 original. 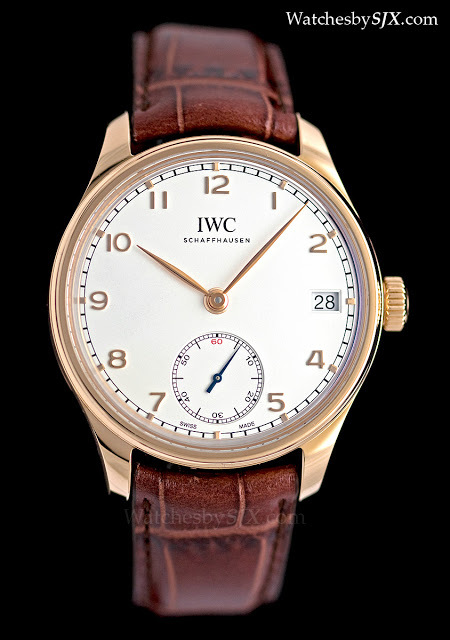 Whereas the original had a detent escapement like chronometers of old, the anniversary wristwatch has a Swiss lever escapement. 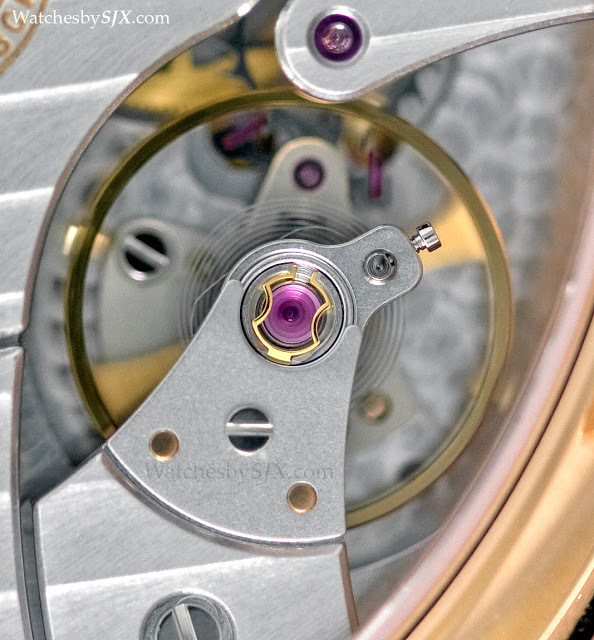 Fitted with a one minute tourbillon powered by twin barrels, the cal. 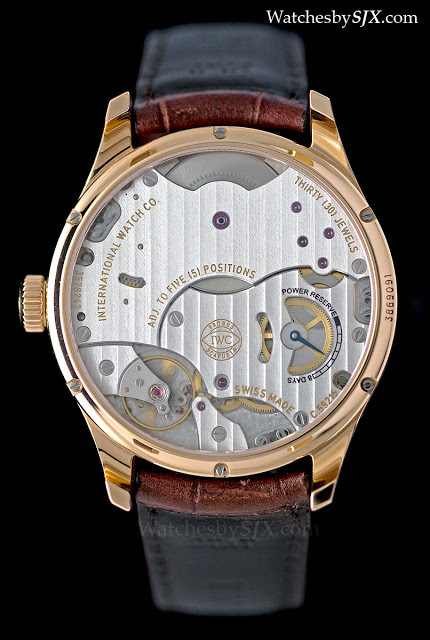 1412 of the anniversary watch has a frosted, gilt finish, with blued steel screws and polished steel components. 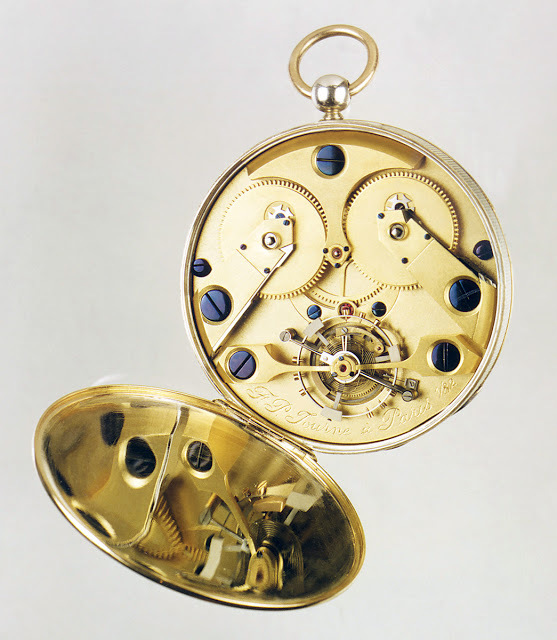 According to Journe, the Historical Anniversary Tourbillon has a higher level of movement finishing, thanks to the technology available at his workshops, than the 1983 pocket watch which the then fledgling watchmaker created by hand. 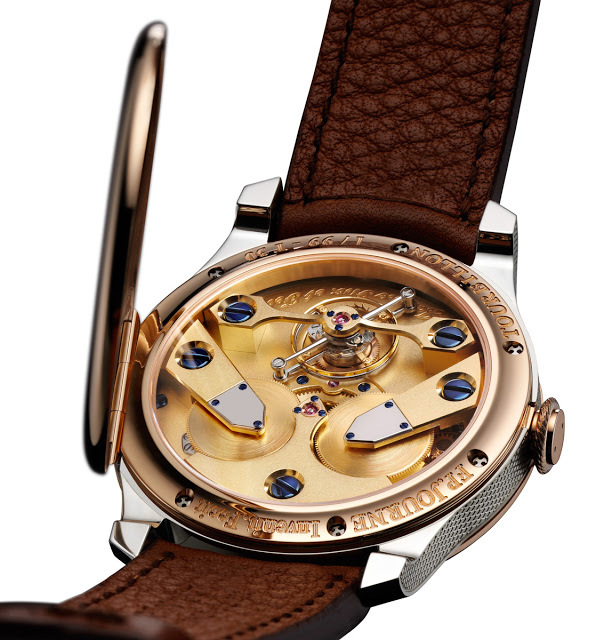 Like all Journe watches the anniversary tourbillon possesses elegant proportions: it is 40 mm wide and 10 mm high. Though different from the usual Journe fare, the Historical Anniversary Tourbillon is nevertheless is a splendid looking timepiece, reflecting the tasteful aesthetic that is characteristic of Journe. 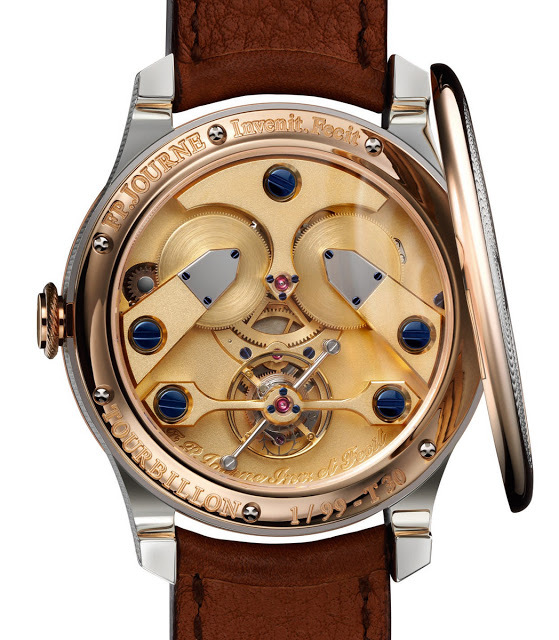 The F. P. Journe Historical Anniversary Tourbillon is a limited edition of 99 pieces, priced at US$99,000 before taxes. – SJX Update 21 October 2013: Article updated to include fact that sterling silver case parts are untreated. Unveiled at Watches&Wonders 2013, the Portuguese Hand-Wound Eight Days is a simple but practical watch with a week’s power reserve and a date function. 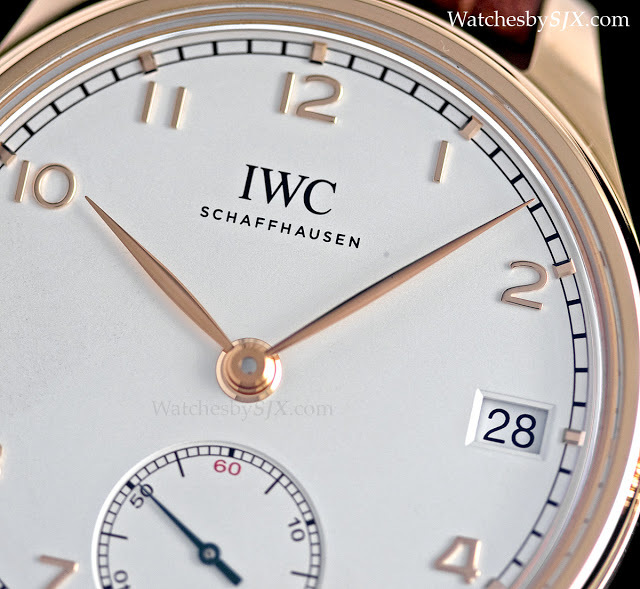 A new entry-level-ish Portuguese wristwatch, the IWC Portuguese Hand-Wound Eight Days offers several features found in other Portuguese models, but never before in the same model. 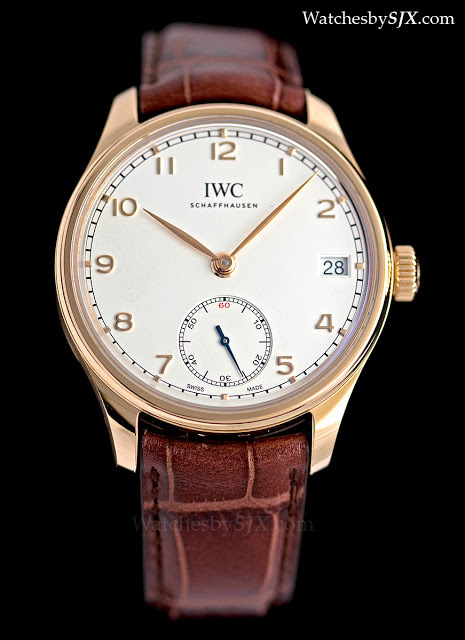 As the name implies, it is manual-wind, with an eight day power reserve and a date function. At 43 mm the Portuguese Hand-Wound Eight Days is slightly large but never overly so, as is typical of the Portuguese line. 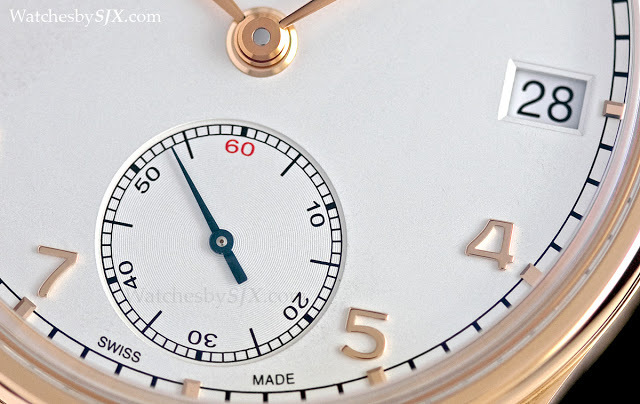 The dial has all the design elements of the Portuguese line – applied Arabic numerals, a railway track minute index and leaf hands. 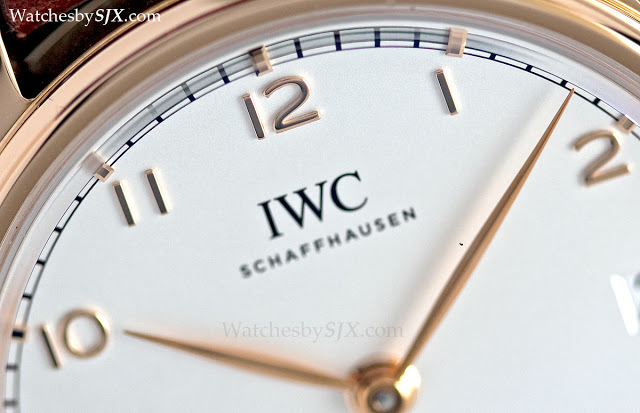 But this classic styling is tempered by the date window at three o’clock, a feature equally practical and incongruous in such a design, and the contemporary “IWC” logo instead of the italicised logo of old. 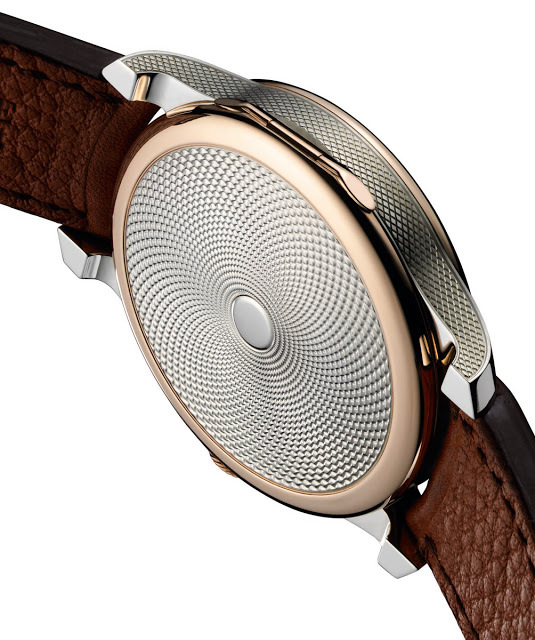 Turn the slim 12 mm case over and the movement is revealed. Equipped with the 59215 calibre, the Portuguese Hand-Wound Eight Days has a 192 hour power reserve, equivalent to eight days. 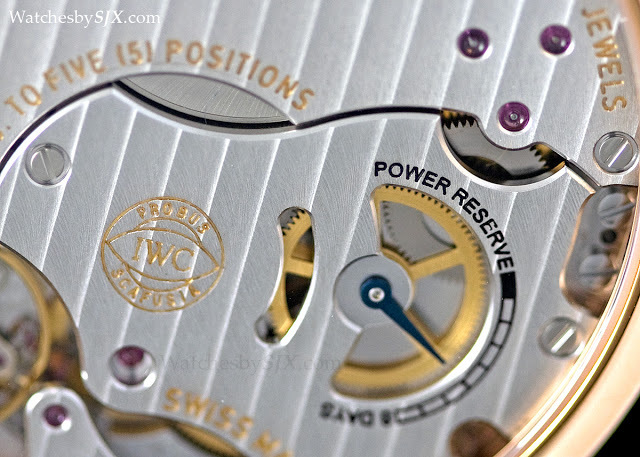 The power reserve indicator is integrated into the centre wheel bridge. The movement has the typical design characteristics of most long power reserve watches, namely a very large barrel, visible at 12 o’clock, and a small balance wheel. 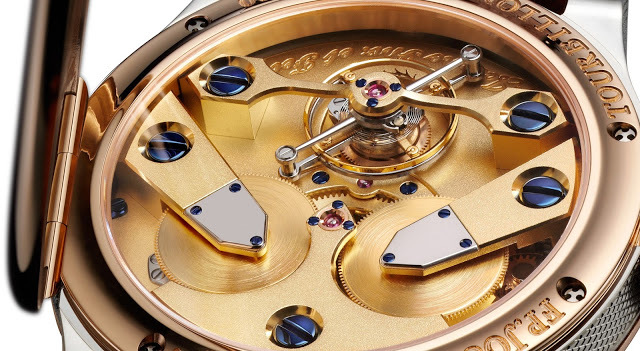 Free-sprung, with adjustable weights and attached to a Breguet overcoil, the balance wheel is an elaborate set-up with all the conventional requisites for good chronometry. Combined with a long power reserve and what is likely to be a flat torque curve, this movement is likely to be a solid timekeeper.